Wash the spinach and pat dry. In a small bowl, combine eggs, salt, and pepper; beat with fork. In a 10 inch nonstick skillet, melt butter over medium heat, rotating pan to coat bottom. Add egg mixture. As eggs start to set, gently lift edges with a spatula, and tilt pan so uncooked portion flows underneath. 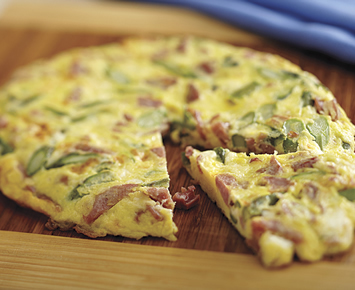 Sprinkle cheese, spinach leaves and chopped ham evenly onto omelet. Take pan and let half of the omelet land on the plate and then flip to fold in half. Serve immediately.